As a paddling enthusiast, I have always thought of getting my kids to fall into my passion but it turned out that it’s actually a lot harder than expected to find a good match. Hence, we took it on our behalf to facilitate the picking process for you by creating a short list of the best kids paddle boards out there. 1 Stainless steel D-Ring on the nose and tail. Sometimes, it can be a little difficult to spot a kids board when browsing online but there isn’t a chance you’d miss this one. Both the name and first impression of the Milkshake give away its target paddler and that’s something to really look for in an iSUP if you want your kid to settle. Nonetheless, the name and strawberry milkshake design isn’t everything you need to know about the board at hand since it actually measures 8 feet in length. Indeed, Milkshake is long enough to cater for kids in-between 8 and teenage hood which gives your kid plenty of time to enjoy it. Moreover, the next big thing has got to be width since this iSUP actually measures 30 inches in width just like standard adult boards, meaning it is going to be even more stable and easier to balance for kids. Lastly, the Milkshake comes at a promising 4 inches in thickness, which adds up to a maximum load capacity of 150 pounds. The biggest concern we have when getting an inflatable paddle board has got to be quality which is why you’re looking for the best inflatable paddle board for kids. Thus, it is of great importance to bring to light the fact that this board is actually reinforced via a double-layered PVC coat, which extends to cover the sides and edges completely, leaving no room for mishaps. Further, Milkshake is made even stronger via a military grade drop stitch construction which pulls the hull ends tightly together, reducing the possibility of damaging it substantially. Features have got to be the most neglected quest when looking for kids paddle boards where it actually deserves some more attention. Indeed, if you look closely at the board at hand, you’ll realise that it comes with a bunch of little details which make it surprisingly more enjoyable. Starting at the surface level, the board features a decent size gripping-pad that will improve your kid’s stability and help him or her balance themselves easily. Then, there is the little cargo net, which will serve the purpose of securing anything from their sandals to paddles whenever needed. 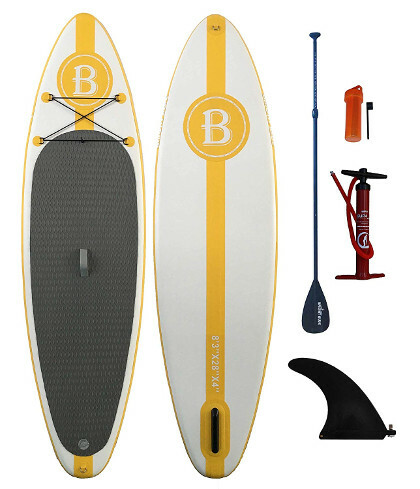 Finally, the board also features large a towing D-ring on the nose and an ankle leash D-ring on the tail. Eventually, it almost always comes down to packaging before we can make a verdict on the best paddle board for kids and it seems like Milkshake actually has a decent shot at it. There is definitely a huge advantage to kids paddle boards with big brand names because it naturally reflects authority and quality and that gives this Ten Toes board the higher ground. 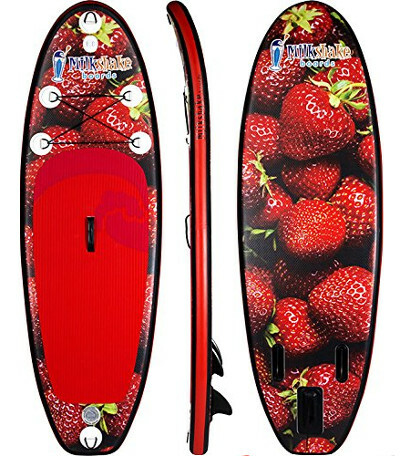 However, in order to make up your mind, you still need to know a few determining details about the board so that you can figure out whether this is the best inflatable paddle board for kids or the one you’ll forget about. Primarily, it is going to be really hard to forget about this board since it really starts off as one of the toughest contenders on this list. Indeed, the board at hand measures a wholesome 8 feet in length which already covers up for kids between the age of 8 and teenage hood. Further, the Nano exhibits a respectable 30 inches wide platform which will make it easier for the paddler to gain stability and balance things out easily. Lastly, the cherry on top of the cake for this little equation must be the 4 inches thick hull of the Nano since it automatically links to sturdiness and weight load. Speaking of which, this board can handle up to 120 pounds. Realistically speaking the Ten Toes Nano iSUP might just be the toughest board on this list since it is the descendant of a highly reputable brand but most importantly because it is made out of military grade PVC material which is the same stuff zodiac boats are made of. Further, the board at hand doesn’t put a limit on quality there since it is fortified via an industrial drop stitch construction that pulls the hull tightly together, making this Ten Toe virtually indestructible. Perhaps you still need proof to believe that this is another great inflatable paddle board for kids and you’ll be satisfied when you take a look at the basic features of the Nano. This board exhibits a lot of strengths, starting at a super soft EVA textured foam deck pad that’s quite comfy. Also, this iSUP comes with a subtle cargo net on the chest to help your kids secure anything from their paddle to their sandals which will come in handy when they leave the board for a swim. Lastly, one of the board’s strongest features needs to be the triple fin navigation system that will help the paddler track nicely and react quickly. After everything else is settled, the last component always comes in to make or break the deal. We’re talking about packaging here as it is the part of a board that can make a whole lot of difference. For kids paddle board, you’d think that big brands wouldn’t actually participate in the competition but you’d be so wrong. Airhead is actually one of the leading manufacturers of inflatable paddle boards offering everything from entry level to professional iSUPs. So, they thought that the next logical thing would be to take over the kids’ market as well. So, let’s see how successful were they with their new little Popsicle 730. Airhead calls it the Popsicle because they went with that exact shape which makes you wonder about its performance and how good it really is for your kid. Starting at the central dimension, the board at hand measures an actual 7 feet in length which is a great size for kids between 8 and 10. Further, putting the Popsicle 730 shape to work, Airhead went ahead with a 30 inches wide platform which means extra stability. Lastly, the Popsicle 730 feels right by sticking to the adult size thickness of 6 inches, which will raise the maximum weight capacity of the board to 120 pounds. Size however isn’t everything and especially for inflatable paddle boards. Indeed, to be labeled as the best inflatable paddle board for kids, you must unlock quality trust first. Hence, Airhead made it pretty obvious that they are not going to create anything less rigid than a standard full size iSUP. Accordingly, the Popsicle 730 is made out of resilient PVC layers, which is quite durable. Moreover, the board is made even tougher via an industrial drop stitch finish that secures the hull perfectly, making it virtually indestructible. Once you get quality on luck in your search of the best kids paddle boards, your next concern should be features since they can truly impact the entire profile of a board and its accessibility. The Popsicle 730 features a large Eva gripping pad which will keep your kid in command while completely reducing the chance of them slipping off. Also, this little board comes with a central carry handle which will enable them to carry the board individually on land without complications. Eventually, to get the board to track as nicely as possible and be less agitated, Airhead hooked this board up with 4 fins unlike any of their other adult boards. The prodigy junior is literally a smaller version of the Thurso Surf WaterWalker which can be easily labelled as one of the best all-round inflatable sand up paddle boards in the game. So, your reasoning directly tells you that this would be a great board for your kid. However, the last thing you want to do right now is make a hasty decision that you’ll regret later because there is a lot you should know about the Junior before making the purchase. Starting at the basics, measurements are key in the purchase process since the size of the board will determine whether this board is actually compatible with your kid or not. First things first, length is a strong dimension which is why the brand decided to go with 7 feet 6 inches in order to cater for kids between the ages of 8 and early teenage hood. Also, the board is 30 inches wide which is impressive in itself as it will significantly improve the kid balance and give them plenty of space to move around comfortable without the risk of falling off. Finally, the Prodigy Junior stands at a 4 inches in thickness which is actual not so bad for kids since it raises the maximum weight capacity of the board to 165 pounds. Now that we nailed down measurements, you can already feel relieved because now you know whether it fits or not. However, it is as important to figure out the features of an iSUP sometimes since they can harbor so much value. The board at hand features an amazing gripping pad that will enhance the paddler’s balance and give them more control over the board. Also, the Junior comes with neat cargo net to help your kids secure their belongings or simply their paddle when diving off. 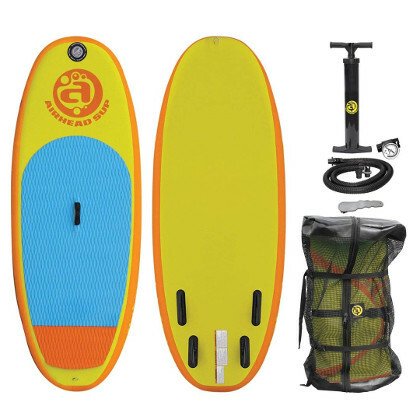 Moreover, the board actually comes with a central carry handle for easy transportation. 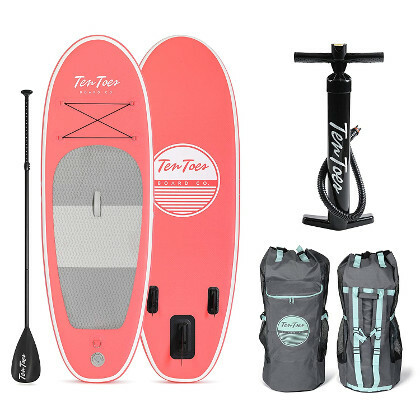 And to ensure its listing as one of the best kids paddle boards, the Junior comes with a nice carry bag to carry all of the above. There is obviously so much to inflatable paddle boards that makes us want one badly and that would definitely explain why our kids want them as well. However, despite being so much more practical and lighter, there is still a lot of processing we must go through before deciding on the right Bright Blue 8’3″ iSUP. Accordingly, in order to find the best inflatable paddle board for juniors, you must take notes of the measurements of said board. Accordingly, the Bright Blue at hand is the longest board on this list, standing at 8 feet 3 inches which is great for kids between the ages of 9 and 15. Further, this board is actually impressively stable which can be justified via the 28 inches wide platform. Lastly, if there is a dimension that should be feared, it would be thickness since it defines the quality of the board and at 4 inches, it’s safe to say that the Bright Blue is at bay. PS: the board’s max weight limit is 180 pounds. From measurements, an equally important factor of purchase has got to be quality and Bright Blue knows that. The board at hand is designed so carefully to take charge of any environment its put through. It features a military grade PVC layered hull that will literally take a beating. Further, the board is made stronger via the standard industrial drop stitching that leaves no room for mishaps. 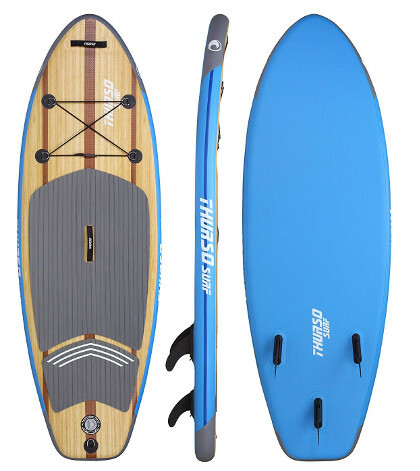 So, if you’re still wondering whether this is the best paddle board for kids or not then you’re up for a treat because this board exhibits a nice little set of features. Primarily, the board features an adult size gripping pad which covers most of the platform to grant your kids the stability and balance required to remain on board on the go. In addition to that, the board comes with a nifty cargo net to help them secure anything from sandals to paddles. Lastly, no board is finished without a central carry handle because it’s the only thing which will make it possible to carry the board individually. Lastly, it is always important to finish up on a good note which is why this Bright Blue iSUP comes within a nice little package. So, which of these is your best inflatable paddle board for kids? Let us know if you have a favorite!